What is a CT Scan of the Head and Brain? Computed tomography (CT) scan (also known as CAT scan) of the Head and Brain is a painless radiology exam, which may be performed to examine the cause of pain in the head and brain area in a non-invasive manner. In the Brain CAT scan, multiple images of the skull, brain, nasal passages (sinuses), and blood vessels in the head are generated. These images are more detailed than traditional x-rays. 1 Who should get a brain CT scan? 2 How is the brain CT scan performed? 3 How long does a brain CT scan take? 4 Is radiation involved in the brain CT scan? Alternatively, your doctor may also suggest you take the CBC w/ diff test and undergo Brain MRI depending upon your symptoms and condition. How is the brain CT scan performed? 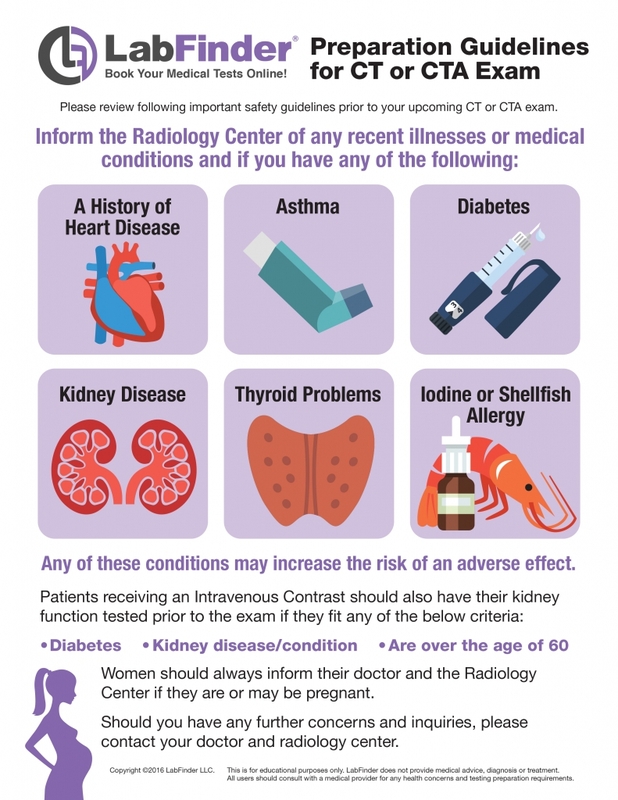 Before starting the CT scan, you will have to remove all the metal objects on your body, including eyeglasses, jewelry, hairpins, and dentures. Then you will have to lie still on the CT scanner table, which will move slowly through a doughnut-shaped machine. Pillows and straps may be used to help keep your head still during the scan. The scanner will move in a circle around your body and X-ray beam will pass through your body for small amounts of time. It will take multiple images that will be displayed on a monitor. During the scan, a technologist will give you instructions such as ‘stay still’ and ‘hold your breath for 10 to 12 seconds’ various times. You will be given a call button, so that you can inform the technologist, in case you face any problems during the scan. For a brain CT scan with contrast, you will be asked to step out of the scanner after the first procedure. Post this, a contrast dye will be administered into your veins. This dye will show enhanced images of your brain in the scan results. How long does a brain CT scan take? A CT scan of the brain is usually completed within 30 to 60 minutes, depending on the preparation required and whether it includes the use of a contrast medium. The scan itself may take just a few minutes to complete. Is radiation involved in the brain CT scan? Once the CT scan of the brain is completed, you will receive your results within 3-5 business days in your LabFinder portal.